It passed with little fanfare the other day, but the city finally approved the East Street Corridor Small Area Plan. 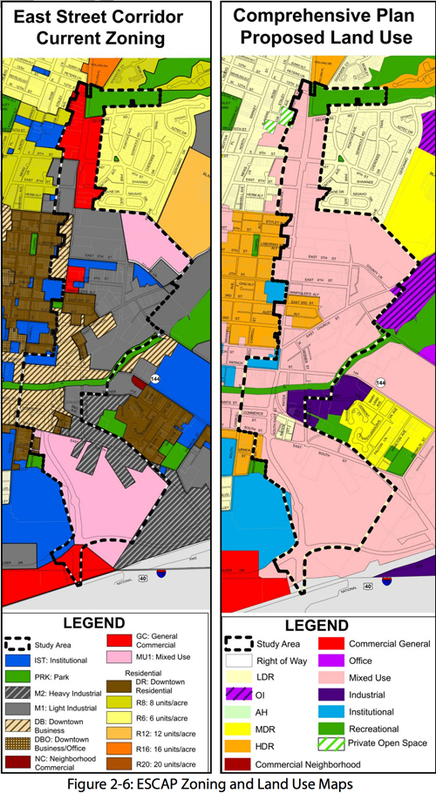 Meant to guide future growth and development along East Street from Interstate 70 to 14th Street, the document has lots of potential, and I think its successful implementation could do a lot to ensure the future vitality of not just East Street, but also downtown and the city as a whole. Currently the area is a mixed bag. Third Street, east of East, is lined with charming and well-maintained historic homes. Everedy Square and Shab Row straddle East Street at the heart of the corridor. 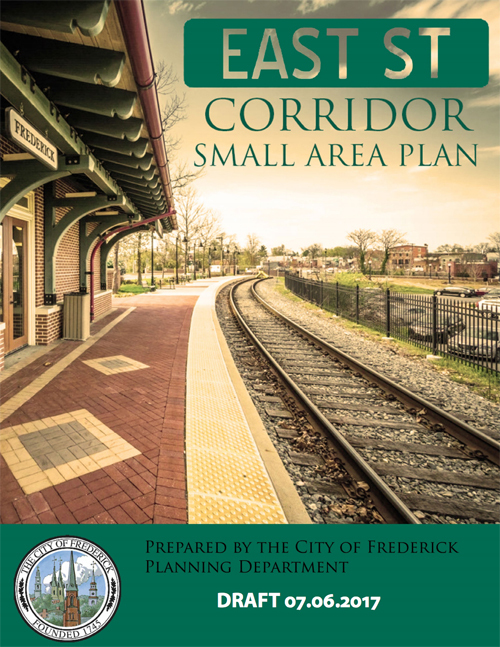 Just below, Carroll Creek Linear Park cuts across it and the Visitor Center, MARC station and headquarters of Frederick County Public Schools anchor the area south of the creek. But elsewhere in the corridor are older industrial sites — both occupied and not — multiple strip shopping centers, some vacant lots and surface parking plus a cluster of car sale and repair shops. Obviously, accommodations for existing businesses must be made — something the aldermen were quick to point out before voting for approval. Nor does it make sense for the city to expend scarce resources in order to push them out. But there is still plenty of potential for rehab and infill development in the near term. And who is to say what a property or business owner will do in the future, especially if the plan makes their real estate more marketable? 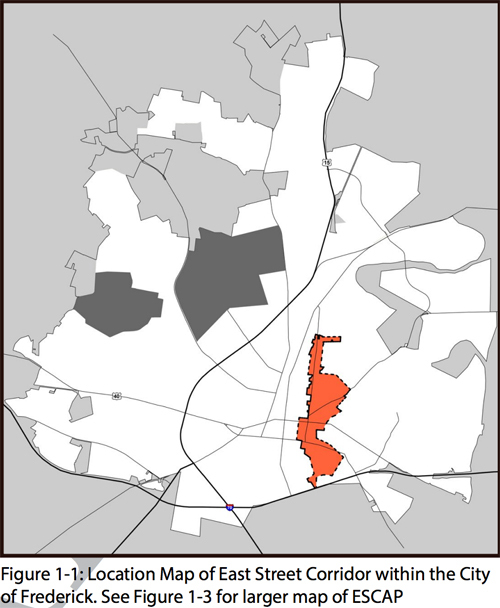 If done right, growth in the East Street corridor could build upon and strengthen the existing downtown by providing a bigger customer base for downtown stores and restaurants, expanding the range of available housing options, and increasing both the overall supply and affordability of downtown housing. It could also provide space for larger floor plate uses that are tough to fit into the tight confines of downtown — things like a grocery store or movie theater. And, by putting more customers within walking distance, residential development along the East Street corridor would make downtown’s existing businesses less dependent upon day-trippers driving in from the suburbs. Which brings me to another possible outcome — one that the plan unfortunately does little to acknowledge. Just beyond the corridor boundaries, Elm Street Development is already well into the construction of 440 units of new housing at Eastchurch. 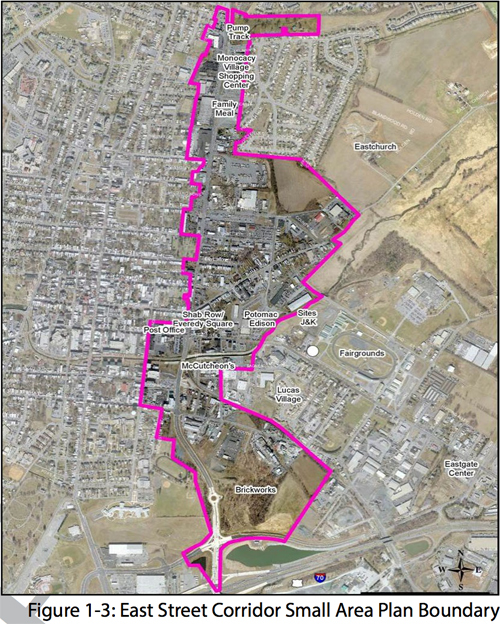 And just across Carroll Creek, Matan Inc. is already in the planning and approval stages of a project that will add a thousand more units at Renn Farm. Redevelopment along the East Street corridor will help “bridge the gap” between these new developments and downtown — making it more likely that their residents might walk or pedal their way downtown, rather than drive. But as positive as all these things could be — resulting in a larger, stronger and more vibrant downtown — they won’t happen without political will. Because when it comes to plans, making one is easy. Sticking to it is the hard part.